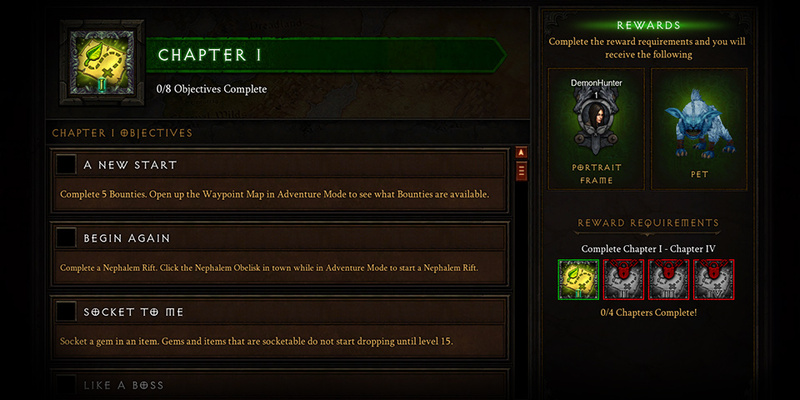 Patch 2.3.0 is headed your way soon, loaded with cool new features for Diablo III. Among all the excitement over what’s ahead for the game, we’ve seen many players ask important questions about what they should expect in Season 4, which we’ll be addressing in the following guide. As before, those who play in Season 4 will have access to Season-exclusive Legendary items, cosmetic rewards and transmogrification effects. We’ll highlight these below, plus the GLOOOORIOUS new Season Journey interface. Ready or not, it’s time to see what’s in store for you in Season 4! 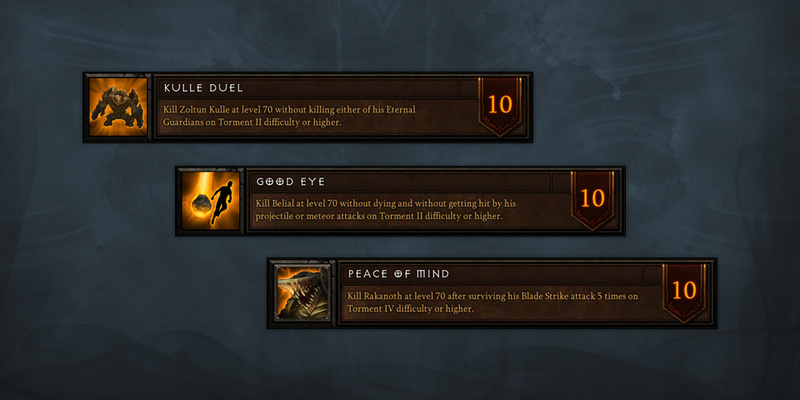 Your journey through Sanctuary is unique, nephalem. In order to better celebrate your accomplishments, as well as guide newcomers through Sanctuary and help players compare their progress from one Season to the next, we’ve added the Season Journey. This helpful tool is easily found on the main menu screen in Patch 2.3.0 when a Seasonal hero is selected, and helps you track and plan your Season progress easily. 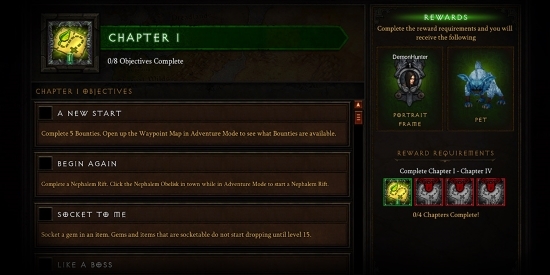 Upon opening the interface, you’ll find the game’s challenges categorized into Chapters and Tiers separated by degrees of difficulty. 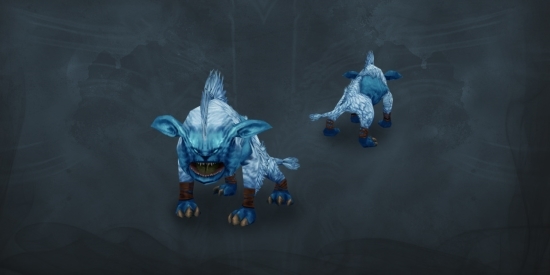 Chapters include challenges designed to be within reach of most players, and should you finish all of them in Season 4, you’ll be awarded a brand new cosmetic pet and portrait. Meanwhile, Tiers represent a true test of your mettle, and grant you exclusive portrait frames upon completion, perfect for showcasing your Seasonal accomplishments. Season 4 also brings exciting new Season-exclusive Legendary items for you to enjoy. These include the Legendary Gem, Bane of the Stricken, along with class-specific items like Dishonored Legacy and Sacred Harness. We won’t spoil the surprise of finding them all, but we’ve included a few of these below, including the purr-fectly crafted new Witch Doctor mojo—Henri’s Perquisition. 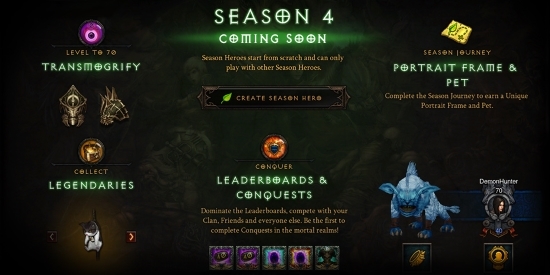 Conquests have returned in Season 4, and include a mix of challenges both updated and new. Among these are On A Good Day / I Can’t Stop and Boss Mode / Worlds Apart, both of which now reflect the brand-new Torment X difficulty. 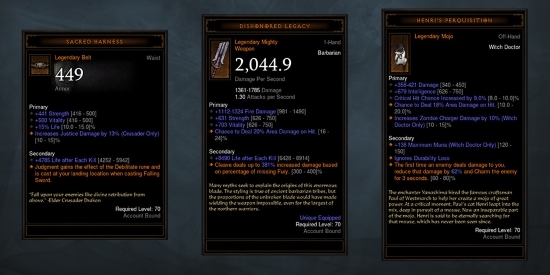 We’ve also upped the ante on Divinity / Lionhearted, which are achieved when you reach solo Greater Rift 60. 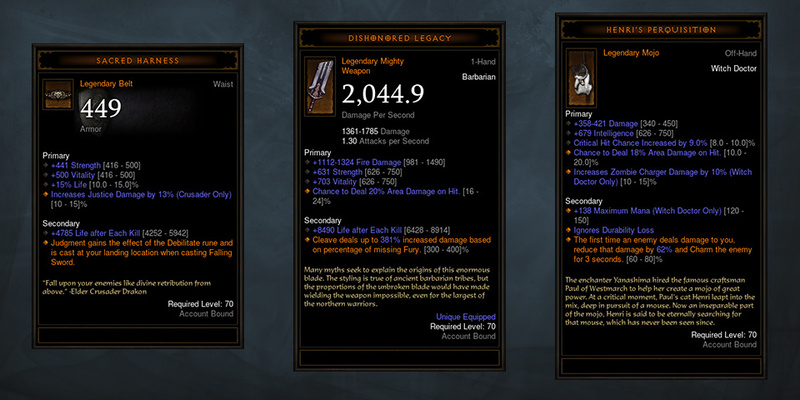 Finally, for the true theorycrafters among you, we’ve added the intriguing new challenge The Thrill / Superhuman, which requires you to reach Greater Rift 40 without benefiting from Class Set item bonuses. 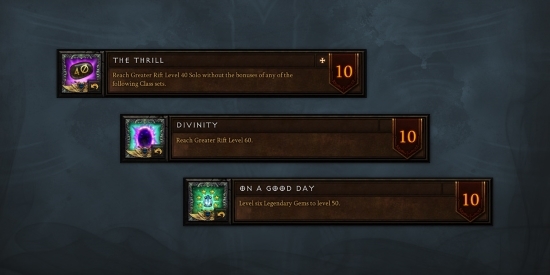 As with Conquests in past Seasons, you’ll be able to see how well you completed these epic feats compared with other players on the Leaderboards. If you’ve somehow managed to chew through these and find yourself hungry for even more challenges, we’ve also added several Achievements requiring you to complete certain objectives when facing bosses. Can you kill The Savage Behemoth and The Undying One within 5 seconds of each other in the Realm of Turmoil? Now, you’ll be able to prove it! 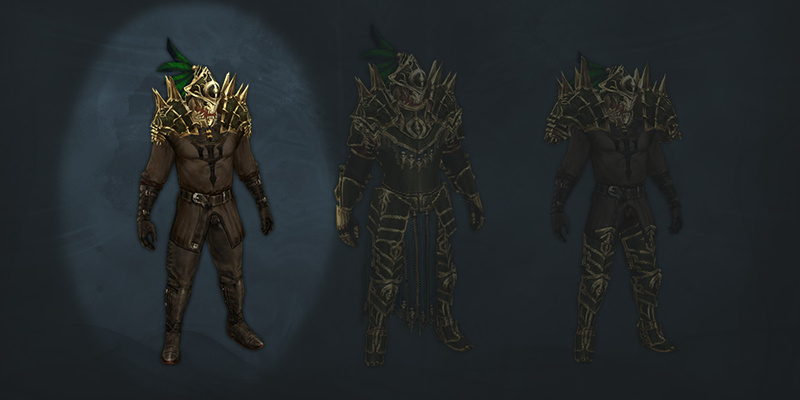 For those who missed out on the Conqueror’s transmogrification set from past Seasons, you’ll have a shot at obtaining a few pieces once more. The head and shoulder parts from this set will be available in Season 4 to those who reach level 70 with at least one Seasonal hero. Q: When does Season 4 start? A: Season 4 begins August 28 at 5 p.m. PDT in North America, 5 p.m. CEST in Europe, and 5 p.m. KST in Asia. Q: How long will Season 4 last? A: While we don’t have a specific timeframe to share for Season 4, we anticipate that it will be at least three months long. Q: When are the Leaderboards being wiped for Season 3? A: Leaderboards will be cleared once the Season comes to a close. Though the leaderboards are eventually cleared, they will be preserved both in-game and here on our website if you wish to review your Season 3 accomplishments. A: Non-Seasonal Leaderboards are tied to what we call “Eras.” We currently anticipate the next wipe to coincide with the transition to Season 4, although this may not be the case for future Seasons. Q: Will Seasons be coming to console? 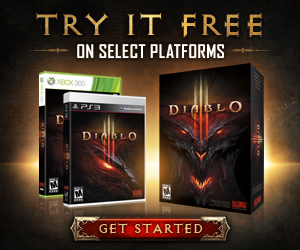 A: Some features on console are best designed for that platform, and the same is true for the PC version of the game. A large part of the fun of Seasons is the entire community rerolling heroes together at the same time. Because the offline and disconnected nature of console does not support this style of play, we do not currently have plans to implement Seasons on console. There’s so much to look forward to in Season 4, and we can’t wait to see what you’ll achieve. With brand new Set items and Kanai’s Cube to shake up the game, this may be our best Season yet! Have you already picked the build you’ll be using in Season 4, or are you planning to see what you can achieve using an old favorite? How far will you go in your Season Journey, and how much power will you wield by the time the Season ends? Share your plans below—and best of luck in the new Season!